1x OE Quality Replacement Exhaust Petrol Catalytic Converter Type Approved Cat. If there is any doubt on the application for your vehicle please provide your registration so we can check fitment. 1x Petrol Catalytic Converter - Type Approved. Please note this is an aftermarket product. Must supply UK Number Plate to confirm fitment. If your vehicle is registered on or after 01/03/01 then by law it requires a Type Approved Catalytic Converter. Due to government legislation it is now a legal requirement on vehicles registered after March 2001 (usually anything with a Y registration or later) to be fitted with a Type Approved Catalytic Converter. The difference between a Non Approved and a Type Approved Catalytic Converter is the amount of precious metal contained in the brick and its overall volume, the parts will look exactly the same. It is a legal requirement to fit the correct Catalytic Convertor to your car. 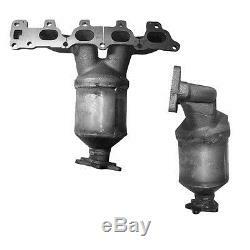 We can only supply Non Approved Catalytic Converters to cars registered in the UK, these will only be dispatched with a registration (Number Plate). This listing is for a Type Approved Petrol Catalytic Converter (Part Number: BM91500H). To ensure correct fitment of a product, please provide your vehicle registration (Number Plate) on checkout - see screen shot below. We cannot take any responsibility if a part does not fit if no vehicle registration was provided on checkout. You shall receive a BM91500H. Having the right connections, and working with only the best companies in the world, we are able to supply our own range of OE Quality Replacement products. BM Catalysts manufactures an extensive range of high-quality Catalytic Converters, DPFs and front pipes. Our Standard and Premium Range parts fit over 28 million vehicles of the UK car parc alone, and are designed for customers who want OE level performance at aftermarket pricing. Please note due to EU Legislation we cannot and will not supply Non Approved Catalytic Converters outside of the UK. We can only supply Non Approved Catalytic Converters to cars registered in the UK before 1st March 2001, these will only be dispatched with a registration (Number Plate). Please be aware that whilst we make every effort to ensure this listing is as accurate as possible, there may be other options that fit your vehicle. There may be other factors that can determine if a part will or will not fit your vehicle. These factors can include, but not limited to, Engine Number, Engine Code, Chassis Number, Production Date, Registration Date, Country of Origin, Transmission Type, Additional Features (ABS, TCS, Air-Con etc). Whilst the checker may say this fits the same vehicle as the one you have, it doesn't confirm 100% suitability for your vehicle. We do ask for the customer to check fitment prior to ordering. We also ask for the registration (UK Number Plate) of your vehicle to be provided on checkout (even if fitment has been checked beforehand). The sales advisors that checks fitment prior to ordering, may not be the same one who processes your order. If no registration is provided on checkout, we will dispatch the item you have ordered. IMPORTANT NOTE RE: STOCK LEVELS. Please see the bullet points below. The quantity of items available is correct at the time of uploading this listing. The item "1x OE Quality Replacement Exhaust Petrol Catalytic Converter Type Approved Cat" is in sale since Saturday, March 14, 2015. This item is in the category "Vehicle Parts & Accessories\Car Parts\Exhausts & Exhaust Parts\Catalytic Converters & Parts". The seller is "clickcarparts" and is located in GB. This item can be shipped to all countries in Europe.